Today I wanted to show you my Retro Embroidered Pearl Diamond Lattice like Bag in white which I received courtesy of OASAP. You may recall that I also have this bag in red which I posted here. I loved the red version so much that I decide to order it in an additional colour. I am just as impressed by my second bag. I adore the structure, shape, pattern, quality and pearl detailing. I’ve been searching for the perfect white bag for a long time; it was one of the few colours missing from my bag collection and I’ve certainly found what I was looking for here. I love these bags so much. It’s very rare to see me without either my red or white version of this bag at the moment. I totally want to order it in black too but maybe having the same bag in three colours would be taking it too far. My outfit also features my new Guess Neodan heels. Unfortunately the photos don’t show them off particularly well because in reality the shoes makes such a statement. I love to wear them with all my pink dresses in particular and I think they’d look good with the yellow dress which I posted here too. Amazing shoes! 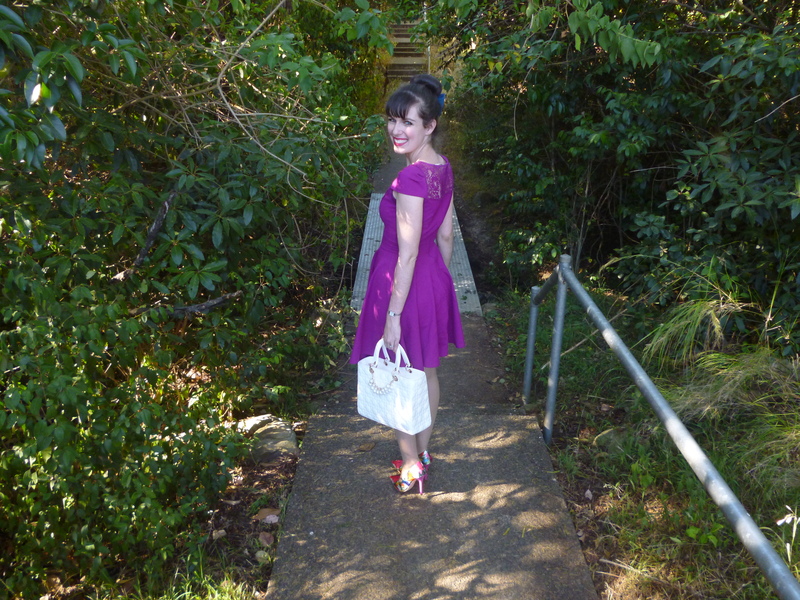 My dress from Alannah Hill provides an excellent base to showcase a myriad of my patterned shoes and bags; for this reason it’s a very reliable and frequently worn piece. I think it achieves the perfect balance. It’s not too plain either as the lace and little bow are a lovely finish. It’s a magenta pink; I’m not too sure why it’s coming up so purple in these pictures. I wish I had better pictures of this outfit but it was a heatwave on the weekend, so incredibly uncomfortable to be outside even for a moment. Those heels are so fun! And I'm loving the bag, I'm afraid of white purses though, ha ha. Hi sweet Tia, This dress is adorable, I love your whole look. That is such a beautiful color on you, Imogen. And those shoes…le sigh. You look so pretty with these beautiful bright colos!!! You have the best dress collection! I love the color of this one! Gorgeous colors here! Those shoes are perfection! So ladylike. I love the shoes paired with that dress! i just adore your style!! the dress is beautiful, and purple, my favorite color!! Your purse goes so well with that dress! Loving your heels, too! Those are gorgeous! The white Oasap bag is really nice, but I'm a bigger fan of the color and fit of the lace dress and those awesome shoes. Love your shoes! Very cute outfit! What a darling dress, I love the rich purple color! That dress is so pretty! I love the purple! I absolutely love this dress! Everything about it – the style, the length, the color. You look amazing in it, my friend. LOVE that bag!! 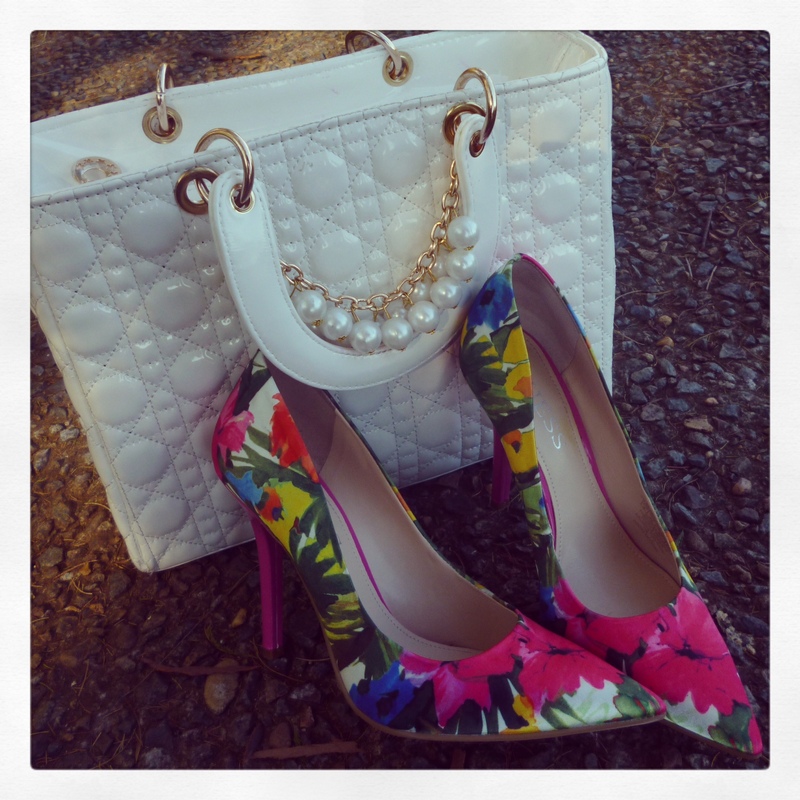 Anything with pearls is uber FAB!!! I may have to check it out!! What an adorable dress on you! Thank you for your sweet comment on our blog! We are your newest followers. You are to cute for words!!! Love that dress with those pumps! I love this dress. And those shoes! I die. This birthday I got a Kate Spade Laptop Bag from my brother and probably it is the best gift I have ever received from anyone.